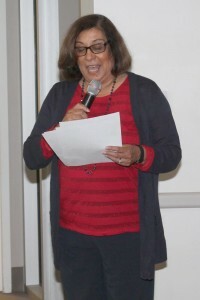 On May 22nd Librarian Cindy Costales welcomed everyone to the Friends Room of the library to enjoy another event of the Laura Scudder Program Series. 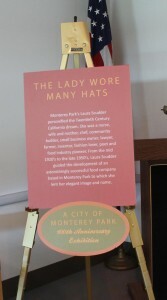 Laura Scudder wore many hats and one of them was her famous Potato Chip business that she established in Monterey Park from 1926 to 1957. Culinary arts were one of her specialties. Mrs. Costales introduced Nancy Zaslavsky to the audience. She is the author of two cookbooks, the James Beard Award nominated, “A Cook’s Tour to Mexico”, and “Meatless Mexican Home Cooking”. She leads culinary tours to Mexico for other people to taste and enjoy good Mexican food. Nancy Zaslavsky spoke her childhood in New Jersey, her education and work in graphic designs. 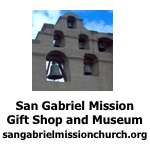 After her marriage in 1970 they moved from New York to Los Angeles where she continued her art education. She also worked in the film industry. She spoke about changing her life by writing and photographing ethnic foods. She fell in love with good Mexican food. She and her husband traveled all over Mexico and she asked for old family receipts from the women who shopped in the various markets. They were willing to share their family secrets with her so she learned to cook good Mexican food from the various states in Mexico. One of their secrets is they cook in small amounts of food with love. 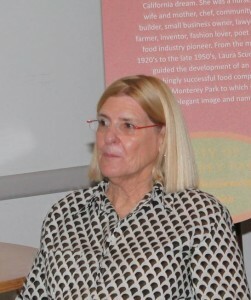 She is a member of The Culinary Historians of Southern California who are dedicated to pursuing food history and expanding the culinary collections at the Los Angeles Public Library. Cindy Costales thanked Nancy Zaslavsky for attending this event. She said enjoyed the Culinary Historians website www.chscsite.org. They support the libraries. Nancy Zaslavsky can be reached at her website: nancyzaslavsky.com or call 310-440-8877 for more information on her Food Tours to Mexico and other locations. 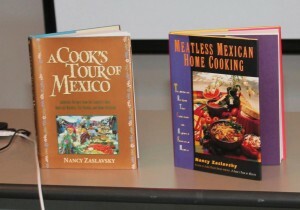 “A Cook’s Tour of Mexico” and “Meatless Mexican Home Cooking” are available at the library for your review.